Well, this was not a good one. 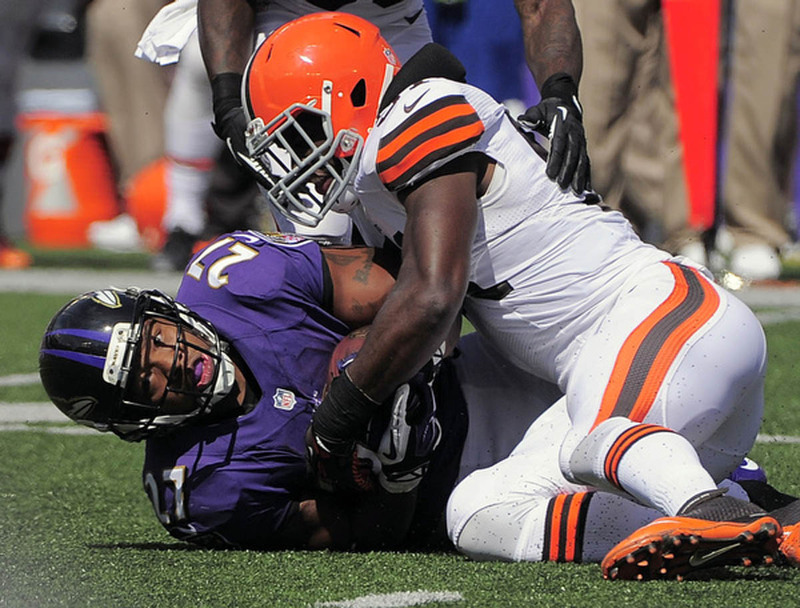 The Browns snapped their 11 game win street vs the Ravens. The Birdss ran for 55 yards on 21 carries. Rice and Pierce were non factors as the oline continued to struggle. The Browns ran for 73 yards on 28 carries. The worst part of this game: the Ravens defense was handeld by Jason Campbell. 23/35 262 yards 3 TDs O INT. This is the line I would expect from Brady, Manning, or Breese vs. The Ravens defense. With another road loss, the Ravens fall to 1-4 on the road (2-1 at home) and 3-5 overall. If the Ravens continue their woes on the road, there is no chance they make the playoffs. Raven defensive front played well sacking Campbell 3 times and stopping the run. The secondary played poor all game, allowing Greg Little 122 yards. They did shut down Josh Gordon(3 rec 44 yds), but they couldn’t limit the damage. Ladarius Webb has been picked on all year. Same with Elam and Ihedigbo. They must improve. The 9 penaltys for 80 yards didn’t help, as well as the -1 turnover ratio. Joe Flacco was pressured all game, including 5 sacks for 27 yards. 24/41 with a 56.1 QBR was terrible, although the Browns defense is very good. The Ravens offensive line may be the worst in the NFL. This game came down to if Flacco could outplay Jason Campbell in the second half and he was unable to. The defense struggling with the pass game and the poor offense need to change soon or the Ravens may be picking in the top 10. Luckily 4/5 next games are home, including CIN, NYJ, PIT, and MIN. This could be 3-4 wins that could put the Birds in wild card contention. Get it together Flacco, let’s get a 100 yard rusher this season please. This entry was tagged Bernard Pierce, Greg Little, Jason Campbell, Joe Flacco, Josh Gordon, Ravens Browns, Ravens Browns Reaction, Ravens Offensive Line, Ray Rice. Bookmark the permalink.